I love chili. 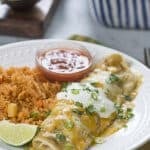 It’s warm, comforting, and you get to top it with things like grated cheese and sour cream. What’s not to like? This particular chili is precisely what is in order on a cold day when you’ve got the game on and lots of people to feed. 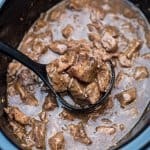 The prep is super easy and then it just has to sit and simmer which means that you get to sit and simmer, until halftime. Then it’s time to eat! 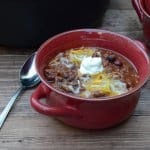 Why is this particular chili so right for game day? 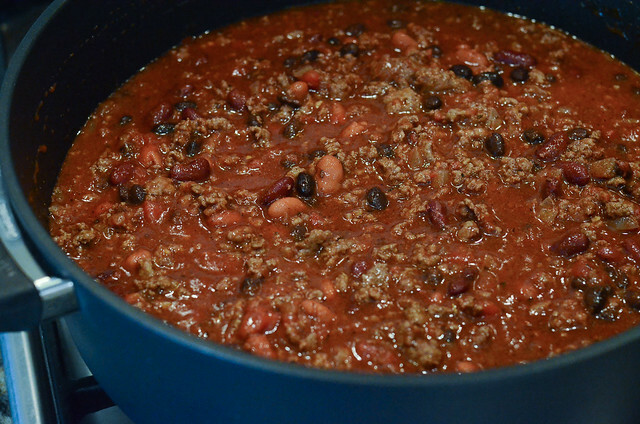 Well, my friends, this big pot of delicious-ness is chock full of beef, beans, and beer. Did you say beer, Valerie? Beer in chili? Do you really think this is wise? I mean, what has the world come to? Boy, you’re just full of questions today, aren’t you? Let’s stop this nonsense immediately and get cooking. 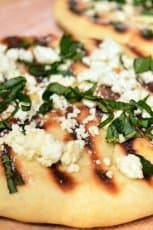 As always, you’ll find the printable recipe all the way down at the bottom of this post. Grab a great big pot or Dutch oven, place it over medium high heat and pour in a couple tablespoons of olive oil. 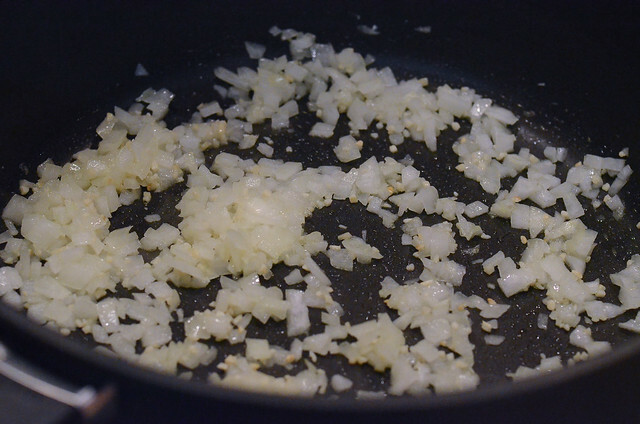 Saute the chopped onion and garlic for several minutes until softened. You don’t want the onions or garlic to brown so watch it closely, stirring occasionally as it cooks. Time to add the ground beef. Cook and stir, breaking it up with the spoon as it cooks. 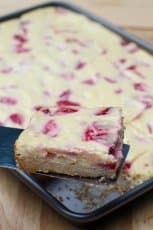 When no pink remains, drain off as much of the grease as you can, return the pot to the stove and add all the wonderful seasonings. Chili powder, cumin, basil, oregano, thyme, crushed red pepper (for heat), salt, and pepper. 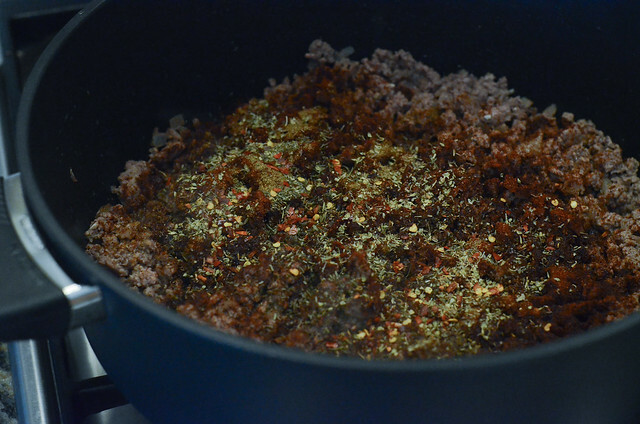 Cook and stir the seasonings into the ground beef for a couple of minutes. 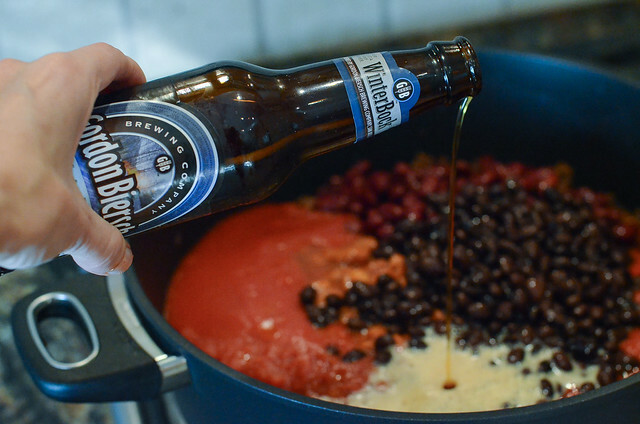 Add all the crushed tomatoes, tomato sauce, all the beans…and the beer. It’s party time! I like to use a nice dark beer like this Gordon Biersch WinterBock. Brown ales work well too, but it’s fine to use whatever you’ve got on hand. The ground beef is happy now. And, so am I. Combine it well and then bring it to a low boil. 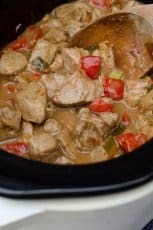 Reduce the heat, cover and simmer for an hour. Pull yourself up off the couch just long enough to remove the lid and then let it continue to simmer, uncovered, for another 30 minutes. Set out some grated cheese, maybe a little sour cream, and let ’em at it. Heat oil in heavy large pot or Dutch oven over medium-high heat. Add onions and garlic. Saute for about 5 minutes or until onions have softened. Add ground beef. 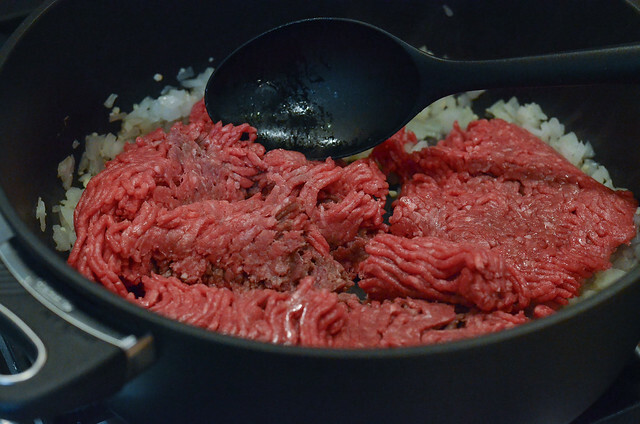 Cook and stir, breaking up ground beef, until no pink remains. Drain off as much grease as you can from the pan. Return pan to heat and add chili powder, cumin, basil, oregano, thyme, crushed red pepper, salt and pepper. Stir 2 minutes. Mix in crushed tomatoes, tomato sauce, beans, and beer. Bring to a low boil, then reduce heat and simmer, covered, for 1 hour. 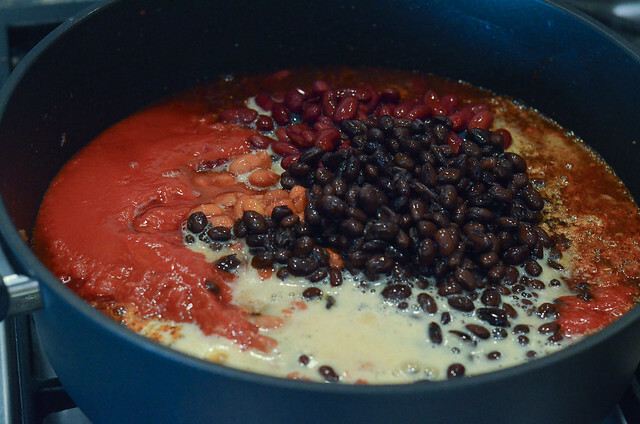 Remove lid and continue to simmer, uncovered, for an additional 30 minutes. 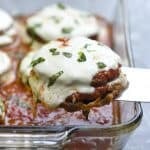 Serve with grated cheese, sour cream, and any other toppings desired. Yum! 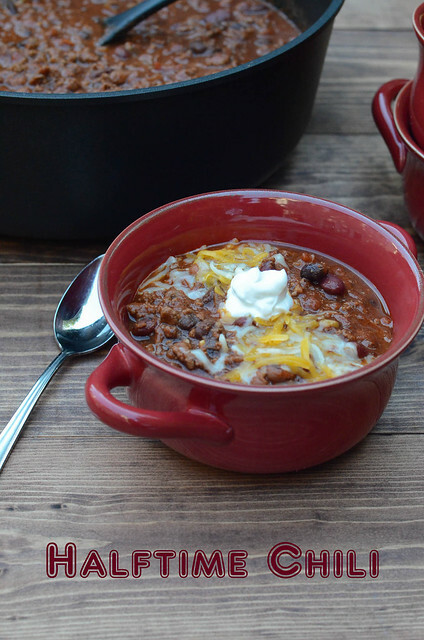 What a perfect comforting bowl of chili! Oh yeah sounds perfect for this cold weather too! I heard it’s a big game this Sunday? 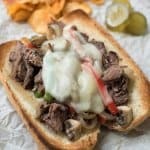 I’m always clueless when it comes to sports but I like to make and eat delicious food while everyone focuses on sports. 😀 This looks so good! I’m glad you guys liked it! 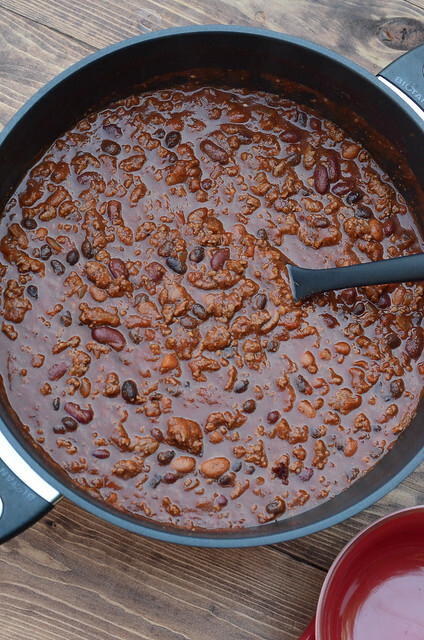 You have to try the turkey chili…it’s also very good. Love, ya! 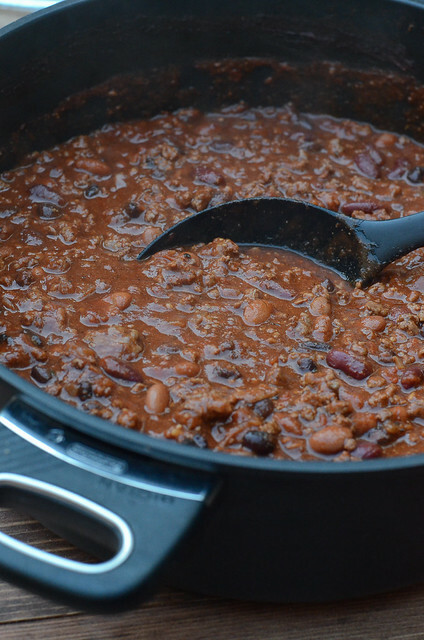 This is the best ground beef chili I’ve ever had, it’s our go to chili recipe. 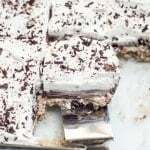 This recipe is for 6 to 8 servings. I was wondering what the portion size is for serving? 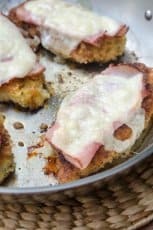 I am making this for about 11 hungry people and don’t know if I should double or triple the recipe. For 11 I would definitely double it, Sharon. 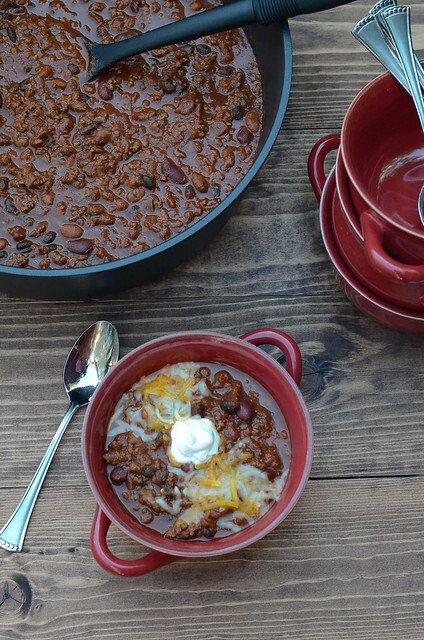 Leftovers are always a good thing when it comes to chili! As written this is plenty for 6. 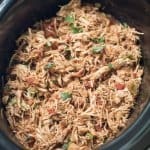 I’m assuming this can be done in a crock pot?